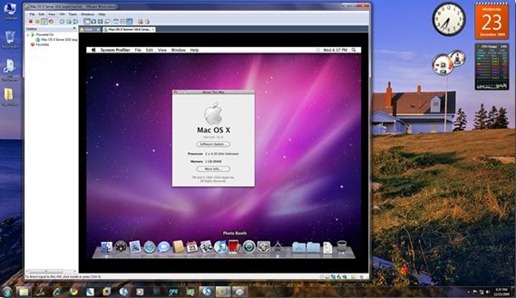 The following step by step guide will help you in installing Mac OS X 10.6 Snow Leopard as a guest virtual machine in Windows 7. You’ll need to have a system with an Intel processor which supports hardware virtualization, original OS X Snow Leopard retail disk, VMware Workstation 7 and Windows 7, Vista or XP installed as host operating system. If you meet all these requirements, you can then install OS X Snow Leopard as a VM under Windows and can enjoy the best of both worlds. Note: We don’t in anyway encourage downloading Apple software via file-sharing / torrent sites and run it in an virtualized environment under Windows. This guide is for informational purposes only. If you like OS X Snow Leopard, Get a Mac. Step 1: Download and install VMware Workstation 7. Step 2: Download pre-made modified version of Snow Leopard.vmdk and darwin_snow.iso files required to get this thing to work. Please don’t ask for the link to these files. You can find them easily elsewhere on the web. 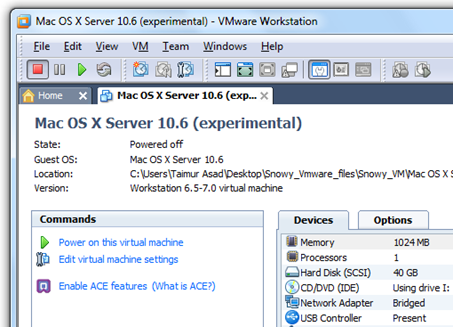 Step 3: Start VMware Workstation and open up “Mac OS X Server 10.6 (experimental).vmx” file which you downloaded in Step 2. 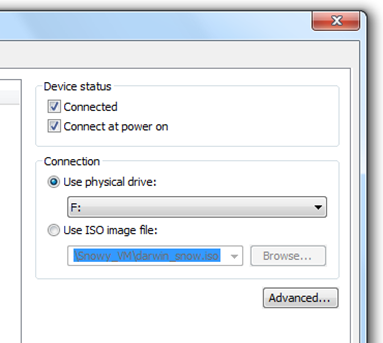 Step 4: Click on”Edit virtual machine settings”, select CD/DVD (IDE) option from left hand side and then and select “Use ISO image file” option. Point it to “darwin_snow.iso” which you downloaded in Step 2. 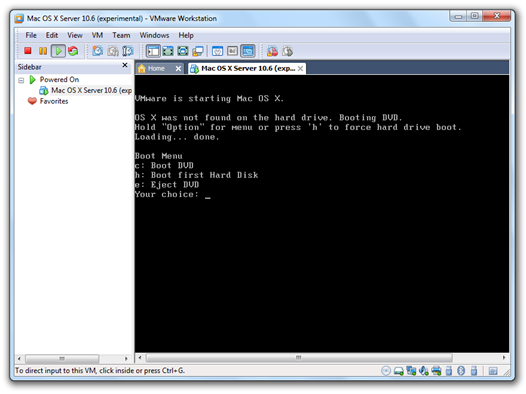 Step 5: Now power on the virtual machine and hit “F8” key. You should now have a screen similar to the one shown below. Step 6: Now you’ll have to point your virtual machine to OS X Snow Leopard retail DVD instead of “darwin_snow.iso”. 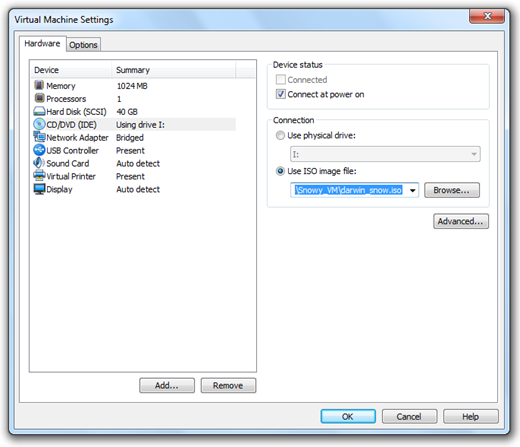 To do this, right click on CD/DVD option found in lower right most corner of your VMware window and select settings. Insert OS X Snow Leopard retail DVD in your DVD drive and select the “Use physical drive” option. Step 7: Now go back and select “c” option (Boot DVD) from the prompt which you got in Step 5 to boot from the OS X retail DVD. OS X boot screen with Apple logo should now appear. If the boot screen doesn’t appear for you, try booting it in verbose mode by pressing “F8” key after selecting “c” option, and then enter “-v” (without quotes). This will enable the system to boot OS X DVD using verbose mode. Step 8: Wait for a couple of minutes for the Installation Setup screen to show up. From here on, simply follow the onscreen setup instructions to install OS X Snow Leopard. Make sure you format your virtual hard drive in “Mac OS Extended (Journaled)” format using Disk Utility. Customize your installation with minimum set of printer drivers and language options for a lightweight trouble free installation experience. Step 9: Once the installation is completed. System will automatically reboot. At this point, close your guest virtual machine and change your CD/DVD option again like you did in Step 2 to point it to “darwin_snow.iso”. Feel free to ask me any question should you run into any problem in getting Snow Leopard VM to work under Windows 7. You can follow me on twitter or join our facebook fanpage to keep yourself updated on all the latest Mac OS X releases. Then when i click ok it shutsdown the program. This error is due to your computer either not having bios support for virtualization or it not being turned on. I had to go into the bios and turn it on, reboot, shutdown and pull the power cord and battery(laptop) to get it to work but that did it. I had the same problem, then I tried with a Retailled MAC OS DVD 10.6.0 (buy separetly) and now it's working. For the “…To run Mac OS X you need a host on which VMware Workstation supports hardware virtualization.” error. I believe you need to reboot the host PC and edit the BIOS setting. Under the processor setting you should enable 'Virtual Processor Support”…i can't remember the exact terminology. You're better to try this: iATKOS S3 v2 with VMWare. Thanks for the guide, everything works great until I get to the OS installation. When I use Disk Utility to format the virtual drive, it stops at the “Unmounting disk” stage of the process. Any suggestions? “Invalid front side-bus frequency 66000000 Hz. sweet! I had the issue where the first boot after installation hung at the grey apple screen, then rebooted a few times and got the beachball of death. To fix this I installed again but set the VM to have 2GB RAM and 2 processors with 2 cores each, this time no hanging at all 🙂 Thanks alot for this guide! Not Working DON’T TRY IT YOU’LL GET ERRORS !!!!!!! “What the hell is a bios?” Good thing this isn’t a dual boot tutorial. Kendall would be in REAL trouble haha. I tried this method with a Lenovo T61p laptop running Windows XP SP3 (32-bit) with all the updates and VMware 7.0.1 and it worked like a charm. I then upgraded to Windows 7 and tried VMware 7.1.1 but couldn’t get it to work. I’ll downgrade to VMware 7.0.1 and report back if it is successful. Thanks! Thank you!! This works with XP SP3 and Windows 7. Both times with VMware 7.0.1. I tried VMware 7.1.1 but it didn’t work. If you don’t know what BIOS is, you really should not be doing this. Not being difficult, but you could really mess something up. Should you disregard the above, your BIOS is the embedded software that loads first when your PC boots. You can hit F2 or something similar when you first turn on your computer to edit your bios settings. You can also as google, he knows. did you find a resolve for this ? I do the first 4 steps but when I want to go to step 5 and power on the Vitual machine an error comes that “Mac OS X is not supported with software virtualization. 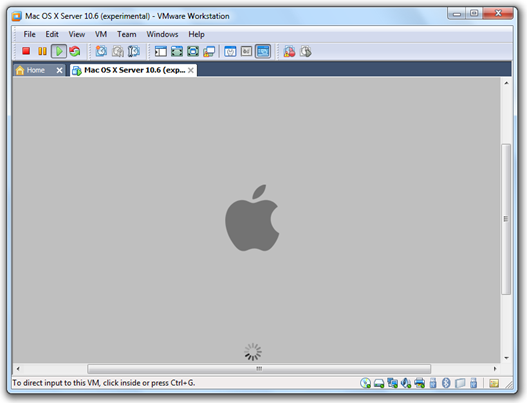 To run Mac OS X you need a host on which VMware Workstation supports hardware virtualization.” What should I do? Hello Megateave. You have to enable the option “Hardware Virtualization” in your BIOS. Check if your BIOS has this option and if is enable. I cant find garageband.. maybe it doesnt come with mac os x…but im pretty sure it did. How do I enable sound input and output. It says it does not find any input or output devices. workstation after installing the MAC from my DVD without using the website files when I wanna log in restarted (The problem is that MAC didn’t log in and the workstation restarted) what should I do? And there is also another question that is my vmware workstation version is 7 final is there any problem with it? Another question is that where is “Hardware Virtualization” option? And How can I find it? Tell me its address from BIOS Menu.Thank you so much. Where is “Hardware Virtualization” in BIOS menu? Please tell me how to find it and its address? No, Garageband is not part of OS X, it comes with new Macs, but it’s part of iLife. I followed the steps and everything works ok, but when I did the step 10 the screen always show the gray apple, I reset several times and happend the same. I have a Dell Vostro 1320 with windows 7 Ultimate and VMware workstation 7.1. Can anybody help me? or wifi. It doesnt have wifi for some reason..
Got a “the cpu has been disabled by the guest operating system” error.